Galang Hendra Pratama (Yamaha Pata | Semakin di Depan | Biblion Motoxracing Team) has been a sensation in his rookie year in the WorldSSP300 championship. Finishing 16th in Aragon and having been the fastest bLU cRU rider in almost every session in 2018 he, unfortunately, crashed out of the race in Assen while battling in the podium group and the 19-year-old Indonesian was determined to bounce back at Round 3. The man from Yogyakarta hit the ground running in FP1, finishing Friday’s free practice in 5th overall after setting a 2:09.029, which was incredibly over a second quicker than the pole record from 2017 and it saw him maintain his 100% record of automatically making it through to SP2 on Saturday. In SP2, he tried to follow other riders in an effort to continue learning the track, but could not quite match his practice pace, setting a 2:09.635 which was good enough for tenth. Unfortunately, he was one of a number of riders to receive a grid penalty for riding slowly on the racing line and he was penalised nine positions but due to the fact lots of others had also received penalties, he lined up for Sunday’s race in 14th on the grid. Local hero Luca Bernardi (Yamaha Pata | Trasimeno Team) was looking forward to racing in front of the passionate Italian fans after he was forced to retire from the race in Assen due to an electrical fault on his bike. The only bLU cRU rider to have ridden the circuit before ended Friday’s practice in 24th overall with a 2:11.011. In SP1, he was denied the chance to set a lap due to an issue with his bike which meant the 16-year-old Italian would have to start the race from the back of the grid in 39th. In Sunday’s race, he put all of his local knowledge to use, getting a superb start and charging his way through the field at a blistering rate. Passing rider after rider and hunting down the group in front of him, he put on an incredible show for the fans to meet the chequered flag in 12th position – having made up 27 places from his starting grid spot – and collecting four championship points to move into 19th in the championship standings and second in the bLU cRU challenge. Fresh from recording the first bLU cRU points scoring finish of the season in Assen after crossing the line in 15th at his home round, Dennis Koopman (Yamaha Pata | Semakin di Depan | GRT Team) was relishing his first opportunity to race at the iconic Imola circuit. Ending Friday in 21st on the combined timesheets with a 2:10.006, the 21-year-old Dutch rider qualified in 26th after setting 2:10.914 in SP1. He did not get the best of starts in Sunday’s race but fought back brilliantly from 26th at the end of the first lap to secure 14th place at the line, collecting two championship points for his efforts. This result sees Koopman 23rd in the overall standings with 3 points, and third in the bLU cRU challenge. Hugo de Cancellis (Yamaha Pata | Toth – YART Team) was another bLU cRU rider to excel during the race, although he did not have the easiest of starts to the weekend. Spending practice learning the complex Imola layout, he ended Friday in 33rd with a 2:12.546 and showed good progress in SP1 by improving to a 2:12.110 to qualify in 32nd. When the race came around, the 16-year-old French rider showed his class by scorching his way through the field to cross the line in 18th, only missing out on his first championship point by just over a second. 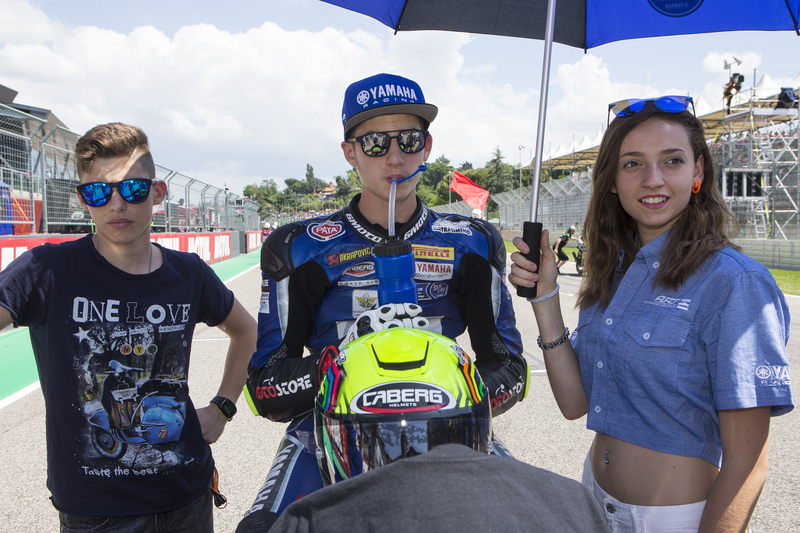 Another rider in search of his first championship point at Imola was Joep Overbeeke (Yamaha Pata | Trasimeno Team). The 18-year-old Dutch rider struggled at the start of the weekend to find the right sprocket setup with his R3 and ended practice in 35th after setting a 2:14.313 before going on to qualify for Sunday’s race in 36th with a 2:13.505. He had a lightning start during the race but, unfortunately, another rider ran wide and then made contact with Overbeeke, meaning he lost a lot of time. Showing true bLU cRU spirit, he got his head down and carved his way through the field to record a 22nd-place finish. To cap off a resurgent weekend for Yamaha, local wildcard Kevin Sabatucci (PROGP Racing) secured the manufacturer’s first podium of the season by finishing in third and there were three R3s in the top ten for the first time in 2018. After showing such incredible fighting spirit at Imola, up next for the Yamaha R3 bLU cRU Challenge riders is Round 4 of the 2018 WorldSSP Championship Donington Park in the UK on the 25th-27th of May. Check out the full bLU cRU results from the race at Imola.